I finished the "Fiddlehead" Scarf last week, and wandered into the Ginger Press to drop it off for Emma to pick up. Maryann stepped from behind the counter to pose for the camera. We’ve had beautiful spring weather this weekend. Snow is melting; sunshine all around. I spent most of the weekend indoors though, either at the wheel or the dyepot. There’s a slowcooker of blue mix. An attempt to transition from turquoise to fuchia pink in 5 steps. Not what I was expecting. The colours are really quite...um...bright. 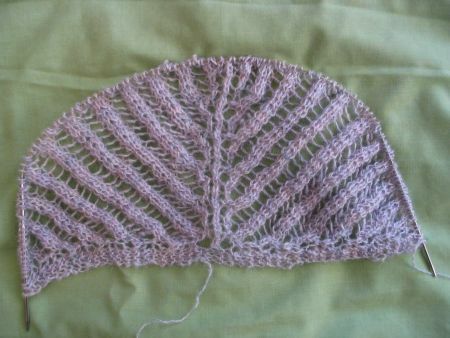 I did get started on the “Hyrna Herborgar”shawl. As I mentioned in this post, the yarn I’m using is a blend of white Icelandic wool and multi-coloured silk from Barb at Wild Geese Fibres. It’s a 2ply, in this foggy bluey-pinky pale grey. As I’d have expected from the fiber combination, it’s neither lofty nor springy. But, IMO, it’s a better yarn for lace knitting than the commercially available éingirni used for laceweight. I worked with the commercial stuff (colour 0484, as a matter of fact) in the late '90s, and found it rough, harsh and scratchy. (Maybe the natural colours would be better?) Barb’s 2 ply, though, has this lovely smoothness and softness, and is just starting to develop a gentle halo. I think the shawl will be great when finished. 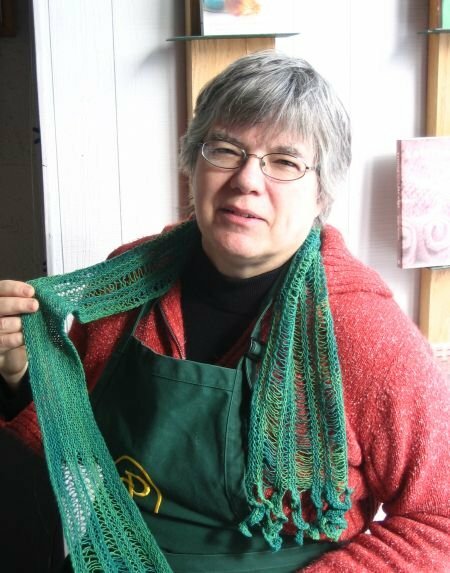 Last I heard there were still some spots available in Maie Landra's class on basic modular knitting, to be held at the Ginger Press, starting this week. Project is the simple scarf (which I pictured in this post). Contact the shop for registration and details. Those colours are fabulous (if you were looking for someone to take it off your hands ;->). I'm glad that icelandic and silk is so nice. I gave a skein to someone recently who is a big fan of icelandic wool and of lace knitting. I have just used Barb's alpaca-shetland (90/10) 2 ply laceweight and it does have quite a bit of spring, thanks to the shetland, but comes out really soft with a nice halo. I would recommend it when she gets more in. And bright is what? Bad? I really, really like those colors, boy. And you're using your crockpot? I have the same one, which I never use. Now I know what to do with it. I have to get me over to Barb's to check out her wares. Haven't been there recently. Not that I need more yarn or fiber, mind you. Nice. Crockpots are the best for dying fiber. I never could understand the microwave camp. Give me a dyepot any day. Once you've spun Icelandic (or worked with Icelanidc yarn produced on a small scale) you won't want to go back to commercial Icelandic yarn like Lopi. I understand that a midwestern farm (and a small scale producer of Icelandic yarn from their American raised Icelandic fleece) is exporting their yarn back to Iceland. Could be the climate. From looking at blog posts, I've observed that bright colors often tone themselves down when spun and especially when plied. I think you'd have to really work at spinning carefully chosen sections and then Navajo-ply to keep the finished yarn as bright as the batt. But I'm writing as a non-spinner and non-dyer. I also like the colors of the roving, but I honestly would have to think a lot about what I could use the resulting yarn for. I really like the colours of your roving Ted. In my experience, once spun up it usually looks a little less bright, but as Mar says...This time of year, the brighter the better, you need a change from white white everywhere. 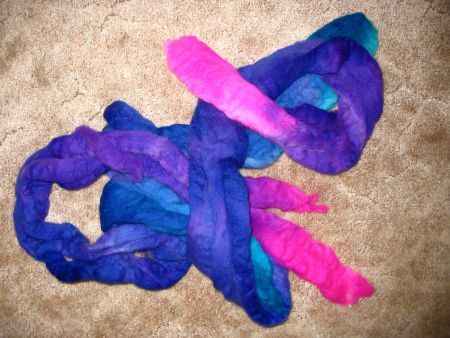 I just finished spinning up some lovely random bright blue from Black Bunny Fibers, and it cheered me right up. 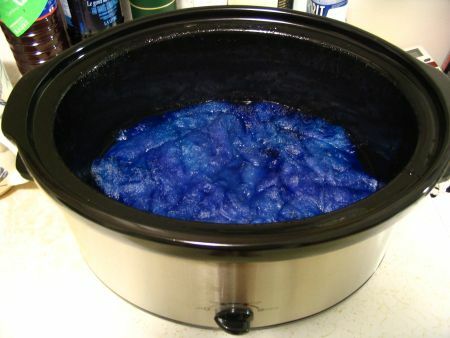 I use the crockpot for my dye projects too. I have had great success with "painting" yarn in it as well. No muss, no fuss. On the Icelandic...it's similar in all the large mills. They buy up 1000's of pounds of fleece, shove good bad and ugly all together, and process it. Small mills take the time to sort the fleece...use it for lace, socks, rug warp etc. depending on each fleece. That's why I usually shop the farm stores and small producers. I love the Fiddlehead scarf, Ted! The yarn and colors are perfect and the "fringe" is delightful.